Every so often, we hear about a trend in air travel that makes us delirious with rage: windowless airplanes, backless seats, fees to print boarding passes. But today brings a trend we can totally get behind (or on top of): reclining at takeoff and landing. The new seats will have an over-the-shoulder belt that must be in place for takeoff and landing. The new seatbelts would click into the already-existing lap belt system. Seats can’t be reclined fully flat until the plane reaches level flight, but 5- to 7-inch recline is available during taxiing, takeoff, and landing, with the lie-flat capability during the rest of the flight. Currently, Qantas is seeking approval for the new seats for their Airbus A330 aircraft. The last few stages include some regulatory approval, but it looks like this service is set for an early 2015 debut. 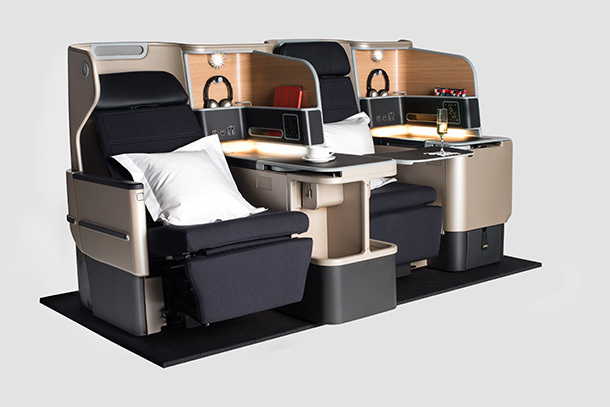 This comes as Qantas refreshes all A330s, including adding new Panasonic seatback entertainment systems throughout business and economy cabins as well as a refurb for all economy seats (so us peasants don’t feel left out). Assuming all goes well, we imagine that other airlines, especially those with long-haul flights, may want to jump into the gate-to-gate recline market. It’s a fairly inexpensive way to add some comfort to cramped aircraft cabins, and airlines are forever wooing premium-class flyers with small add-ons. Count among those add-ons a decent night’s sleep. Readers, would you like to fall asleep the minute you reach your seat?